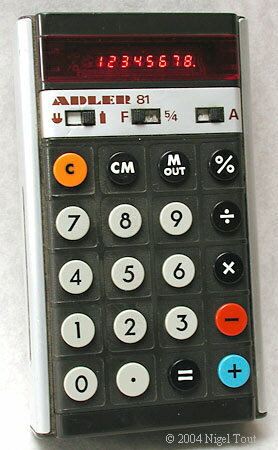 The ADLER 81 model was made in two versions with the name in different places, as shown above. Details below. 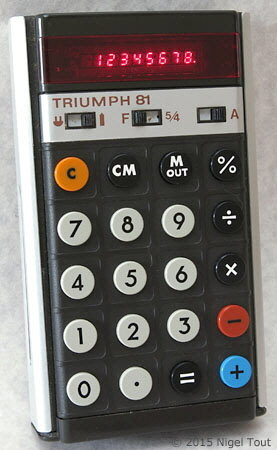 The TRIUMPH 81 model was made in two versions with the name in different places, as shown above. The switch position "5/4" on these models is the same as that marked with a semi-circle on the ANITA, below, and indicates that the answer will be rounded, and will be to 2 decimal places. Have the three-pin adaptor socket so it can be powered from the ANITA AC Adaptor while containing disposable, non-rechargeable, batteries. The ADLER 81 and TRIUMPH 81 are versions of the ANITA 811, shown on the left, labeled for sale by Triumph-Adler. 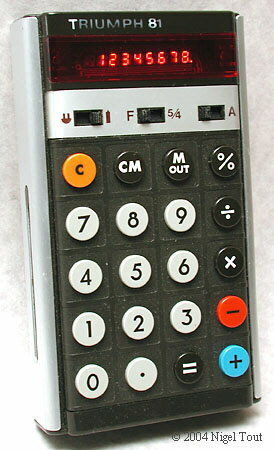 The ANITA 811 was the first Anita hand-held calculator to go on sale.